Searching for Bonobo in Congo » BUSHMEAT 8: Lousy Way to Make a Living When Game Gets Scarce. « The Final Slaughter of Elephants is One by One. BUSHMEAT 8: Lousy Way to Make a Living When Game Gets Scarce. If someone suggested I put in twice the hours of work for half the pay – I’d say it was a bad deal. Bushmeat hunters in central Africa have a bad deal. The stories below are from a part of the TL2 area that, two months ago, was still an un-surveyed blank on our map. It is as far as you can get from any major town – half way between Opala and Kindu. Dino set off with a team to survey this forest belonging to the Langa ethnic group at the beginning of June. 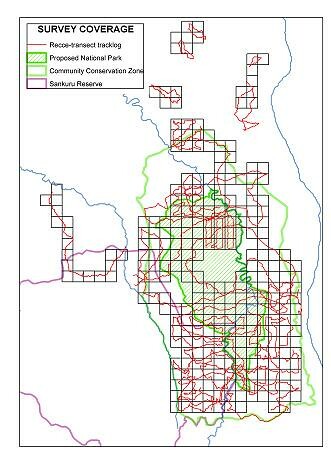 Map showing the survey tracks through the forest and the “blank” that still existed at the end of May. Very remote, but it is not too remote for bushmeat hunters. Dino found that here, like almost all the of Africa’s central forest, animal populations are declining disastrously. In the village of Yaefoto the chief, Iseki Lotaka, declared that when he first set traps (two decades ago) 10 to 20 traps were enough to assure a return of seven animals – enough for any village ceremony, be it a marriage or a mourning. Today a hunter sets 500 to 1000 traps, over a much greater area, far from any village, but will barely get the 20 or 30 animals needed for two bicycle loads of bushmeat. 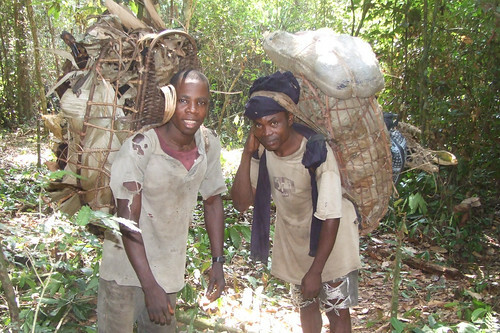 The bushmeat is carried from the Langa forest as far as Bafundo. Each back pack carries five to seven smoked and dried carcasses. 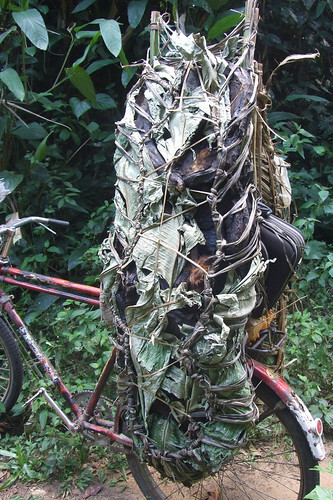 A bicycle will carry the quantity of bushmeat in two backpacks and will take it on to the Kindu market. Later, in the village of Kakonga , Dino got more concrete details from Kandolo who, like most of the commercial hunters, does not call the Langa area home. He is a Mu-Songola from the other side of the Congo River where the forest has already been emptied of animals. Although his wife is Mu-Langa they live in Kindu. He comes the 90 miles on bicycle and on foot to his in-law’s village to hunt their forest. He maintains a trap line, 30 wire snares and 200 nylon snares. His bushmeat revenue is all his family has to send their five children to school, pay their health fees, and buy their clothes. 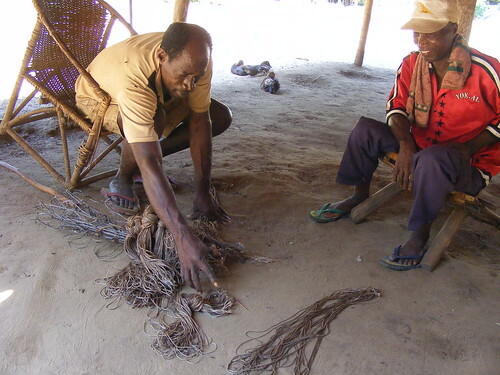 Kandolo with his snares in Kakongo. 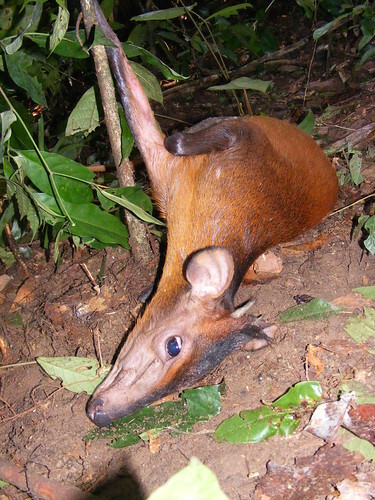 For the period of February until mid-May (his last hunting session) he trapped 20 blue duikers (the smallest and most abundant of this forest group of antelope) and 10 red duikers (several species of larger antelope), five red river hogs, four brush-tailed porcupines and two guinea fowl. Red duiker (C. nigrifrons) Dino found still live along a trap line in the Langa area. 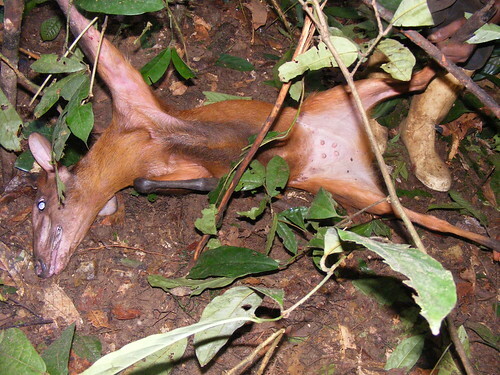 This Red duiker was a mature female who alas, will reproduce no more. After subtracting what he spent locally during those months, Kandolo earned a total of 134 USD, at that rate he would earn less than $460 per year with the same continual effort. What kind of standard of living will that income secure in Kindu? For one student, yearly costs include inscription, a monthly fee for teacher’s pay, and a trimester fee for chalk and school maintenance. The total annual fee is $ 50.00. Dino took a photo of these goats, chickens and ducks in a Langa village. They are not seen as an alternative to bushmeat. If there were other opportunities, bushmeat hunting would be abandoned. Here in central Congo poverty will empty the forests. This entry was written by Terese Hart, posted on 2009-08-12 at 7:30 pm, filed under Bushmeat. Bookmark the permalink. Follow any comments here with the RSS feed for this post. Post a comment or leave a trackback: Trackback URL. 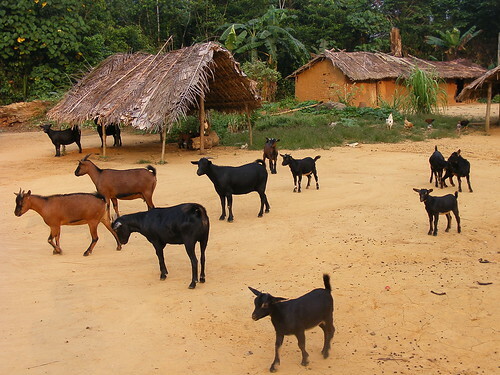 Can you explain why it is that domesticated animals such as goats can’t replace bushmeat for these people? Since, as you document, bushmeat has become hard to find even in the remotest areas, what’s keeping animal husbandry from looking more attractive? I would guess that hunting has eliminated the leopards that would have once threatened livestock. Terry, your blog is heartbreaking. I am imagining the world you are describing. I can’t of course but I can remember being in country N of Kisangani and flying over vast areas of E Zaire. Are you on the ground or remaining in Kis? Is John doing all that? Who is in Epuulu and finally,are you and John safe? I read such awful stuff about the E border area and I know you are far from it but I don’t know how far all t hat horror infects the interior.